The story is repeated daily in virtually every corner of society, whether it be the boss’s proposal for the future of your company, or the president’s chief envoy to the U.N. It rears its ugly head in grandma’s digital scrapbook, and invokes the shadow of defeat in the college student who spent countless hours in the study rather than party with friends. 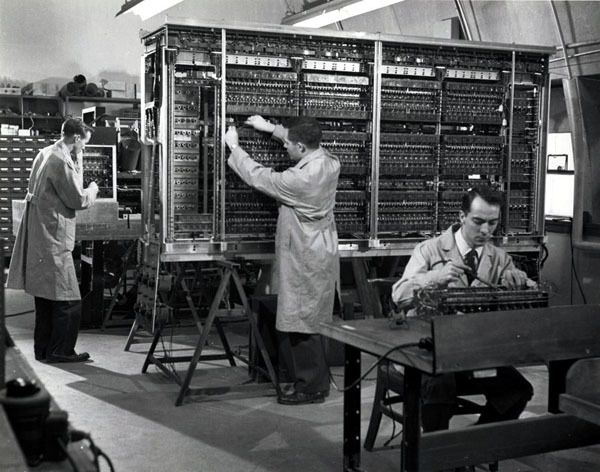 It would be fair to say that many thousands of hours of productive work are literally flushed down the cyberspace drain daily, never to be recovered again. Indeed, the death of a file is a hard thing to face. The funeral is brief, but recovery is long and grievous. Ouch, please stop telling me that I should have backed up my data. I don’t need to be scolded, I need to move on with the least pain possible! Here are some thoughts to help you move on. * Find a place to “save as”. This is one of the most powerful tools Microsoft has ever come up with. Saving a file with a save as allows me to not only name the file and put it anywhere I want, I can rename the same file as many times as I wish and then save it again fully identical to the other files I have saved.You may want to create a folder on the Desktop for faster access to your work .Simply right- click on the desktop then, New>Folder and a “new folder” will appear, just rename it. 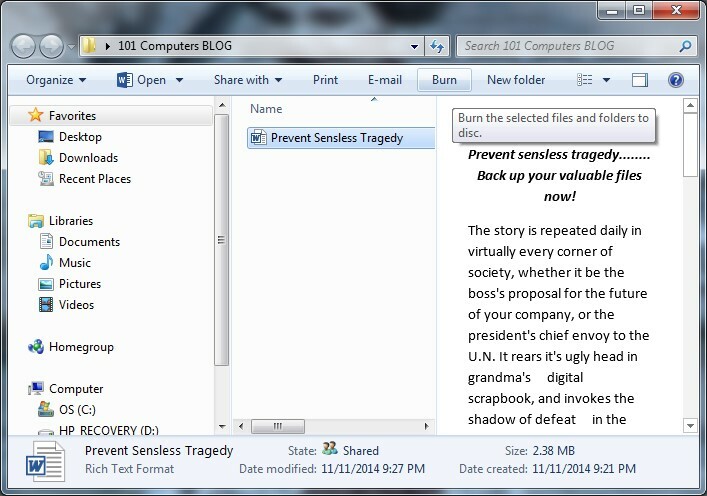 In the above example, I am placing this file on the desktop and calling it” Prevent Senseless Tragedy”. * Burn a CD or DVD with your valuable file(s). Most PCs now have a DVD burner to burn up to 4 Gigabytes of data. 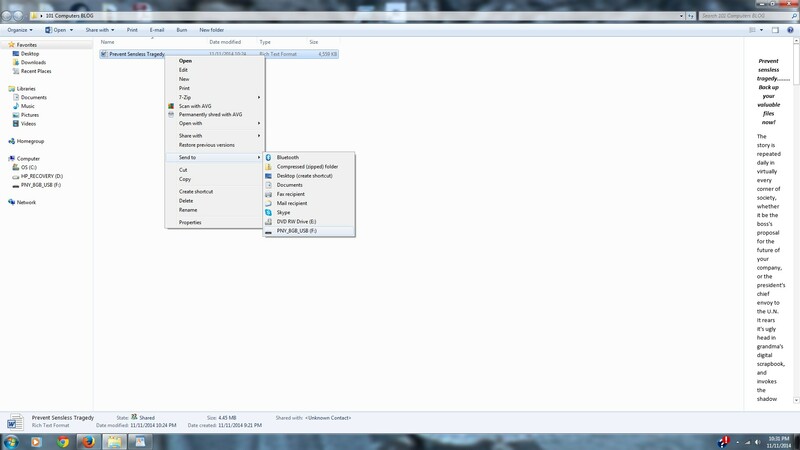 The process can be as simple as selecting the file you saved in a folder, then selecting “Burn” from the top menu. Simply put a CD or DVD in the tray and follow the on screen instruction. You may select several files, or just one. 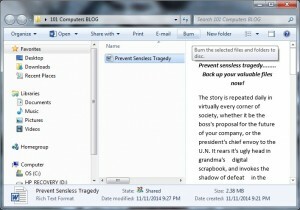 Above the highlighted file is located inside the 101 Computers Blog folder, (from the desktop). Notice that “Burn” is selected. The computer will now prompt you to insert a disk for recording. The disk will be a long term backup. * Copy to a USB STICK. The USB “Stick”, “thumb drive”, or whatever it may be called, the little usb plug ins are really cheap as of this writing. About a dollar per Gigabyte, this is the most portable memory money can buy. It is easy to carry and can be an alternative to a disk or hard drive storage. When inserted into an usb port, this device looks like another hard drive in the computer. 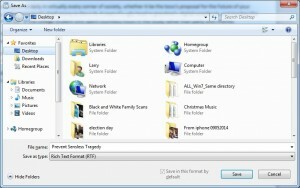 Saving your file is as simple as writing to a directory on your computers built in hard drive. Simply open the folder containing the file, highlight the file, then RIGHT- CLICK>SEND TO>Memory Stick (PNY in the following screenshot). 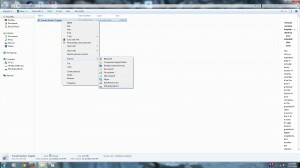 In this screenshot after a “Send To” the USB memory Stick, the file is now safely backed up on the portable memory stick. * Copy to an external USB Hard Drive. The process is Identical to the Copy to a USB STICK, except the drive is a mechanical or solid state high capacity drive in an enclosure, which may or may not require external power supply. Most hard drives are in the 500 Gigabyte to 4 Terabyte rage. The cost is rapidly decreasing. * Copy to “THE CLOUD” This is what scares people. The cloud is simply “offline” storage, or remote storage. To save files this way requires a high speed internet connection. The process is not complex, but can be confusing. There are free and fee storage locations. Google is really big on this, as are Apple, Yahoo, and Microsoft. 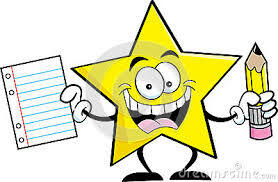 This is the subject of another blog, so stay tuned. * Copy manually with pencil and paper. Definitely “Old School”! Not really the way to go unless you are a hardliner. You probably shouldn’t be using the computer! As you can see, there are many options for backing up your files, and there need not be a pity -party, or a computer smashing Since you have now prepared yourself for any one of those unforeseen Microsoft “Blue Screens of Death, computer failure, or any other “fat fingered” data erasures.